A Smart Micro-Grid (SMG) as the name suggest operates on a much smaller level to the Smart Grid. It is typically envisaged as operating within the proximity of a 20kv connection to the grid. The maximum generation within a SMG ranges from 2-5MW, with the maximum wind on that system of 500kW. Thus SMG’s are smaller versions of the Smart Grid that is expected to be rolled-out nationally. However, SMG’s although still in test phase are expected to become on stream in the near future, i.e. 1-2 years: that is much sooner than the national Smart Grid. SMG’s operate very similarly to the Smart Grid as discussed above, insofar as there is a dynamic pricing system which rewards consumers for who defer electrical loads to times of highest production and lowest demand. Pricing and meter management is conducted by a licensed operator who acts like the grid operator on a smaller scale. There is also the need in SMG’s for ‘micro-utilities’ which will look after the billing and customer service of the systems. While much work has been done, there is still a great deal more needed to devise the management, IT and communications systems necessary to establish a functioning, safe, smart micro-grid. This presents an opportunity for a community to get involved in SMG’s as a test bed. SMG’s will change the business models available to renewable energy community groups. While to date there has been a bias in favour of large scale (>2MW) generator-to-grid projects (via the GATE process), and also of sub 500kW auto-producer projects, through SMG’s there may be opportunities for much more diverse (in scale and technology type) generation projects. With the possibility of selling, through the licensed SMG operator, to local customers, community scale generation may find that AD, CHP Biogas and PV work better financially. SMG meters can operate on a 15 minute or even second-by-second basis depending on the requirement o the licensed regulator. In one SMG test-bed in Dublin, the meters used are second-by-second. The meters communicate remotely with an aggregating data-centre which records and regulates energy demand which is balanced with the energy available from the generators on the system. These generators, where they can, increase or decrease energy production again, according to demand. The testing required for the safe operation of SMG is very rigorous. 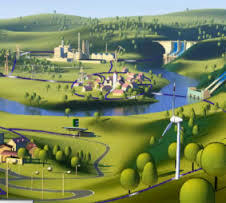 It is a highly complex system which offers enormous benefits to the national grid operator by way of safer renewable energy integration onto the network. However, it also requires very careful management and control systems. There are a number of SMG systems being trialed in the Universities but only one in the real-world environment, albeit on a small scale. This test-bed will be reporting on its findings towards the end of this year, after which time it should be seeking to acquire a licence to establish SMG’s in Ireland sometime in 2015. The SMG business model has not yet been fully developed. As such the exact nature of the balance between consumer and producer gain and its price structure is unknown. However, there is an expectation that producers and consumers will share in the benefits of the new arrangements to the extent that medium scale generation projects which were not previously viable will become more so and that consumers will on average pay less for their energy needs. A component of this market viability will be the co-operation of the Department of Communications Energy and Natural Resources. The value to the grid of a reliable renewable energy supply while recognised has not been fixed in terms of monetary value. SMG’s are requesting a price support to be given to the energy distributed within a SMG (a so-called ‘white premium’). This is as a result of its superior dispatch reliability. The Safety of Smart Grids depends on the parallel roll-out of ‘hardened nodes’. These are micro-grids capable of self-sustenance for periods of time, in ‘island mode’, to prevent against catastrophic grid failure and contagion of fault issues – hardened nodes have been called ‘the hard shoulder of the smart grid highways’. These micro-grids, require active local generation which is balanced, or power matched, locally through independent automated and regulated systems. This automatically balanced or ‘refined’ green-energy, has been called white energy, and could be supported by a new self-financing White Premium (i.e. a price support mechanism due to its value to the grid). However, a decision on the extent if at all of a white premium is in the hands of the Minister at the DCENR.